Last April, I swore off ward basketball jokes. This after I had produced over a dozen of them for my March Madness series of gags. I guess old habits are hard to break. 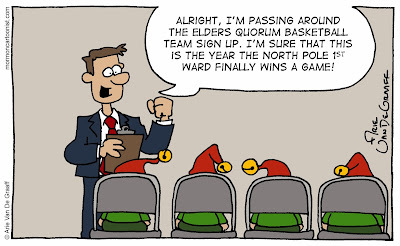 So, when was the last time the North Pole 1st Ward won a game? They beat the Keebler elves in a scrimmage once; but when you're playing yetis and abominable snowmen in stake ball, you really don't have much of a chance. 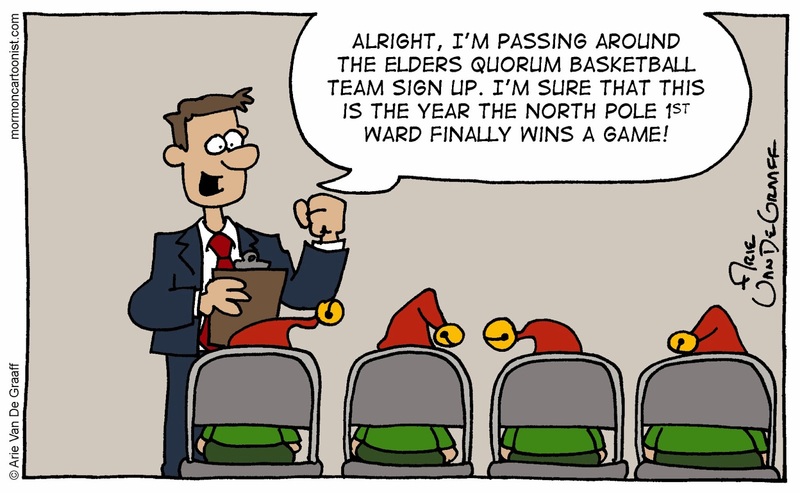 I'm impressed that you were able to combine two of your running gags so well: The north pole 1rst ward and ward basketball. Now had you thrown in something about pinewood derby you would have hit mormon cartooning gold. How could I forget the pinwood derby cars?! Everything is better with pinewood derby cars!